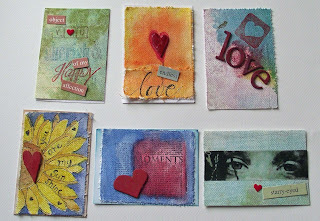 Today my post is some ATCs I've made for a swap with the the theme 'LOVE' being organised by my crafty mate Sandra. I have been facinated by Art Journalling for a while now and I wanted to use this style in my ATCs. I have created all my backgrounds with canvas, using watercolour pencils, distress inks, glitter sprays and glue. I then added either stamped or hand drawn images to the backgrounds. 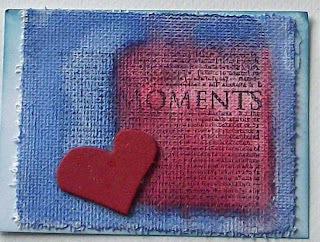 This is a piece of canvas with a distressed ink background using Ranger Tumbled Glass ink and some glitter spray for the 'starry' effect. 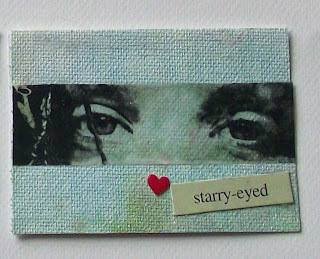 I lifted the image of the eyes from a magazine photocopy with clear sticky tape and adhered it to the canvas. 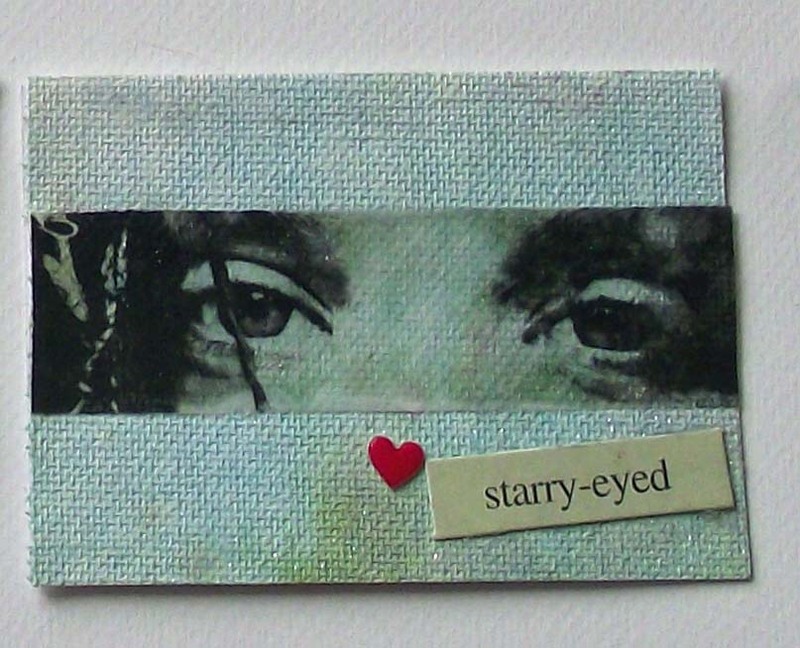 I added a small heart and the text ' Starry Eyed' to finish. This backgrouns was created with watercolour pencils and spritzed of water with the blue rectangle and the red square my homage to one of my fav artists Mark Rothko. 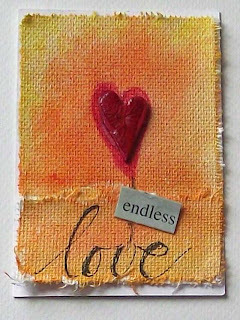 I added the stamped image in Staz-On black using a Hero Arts Stamp 'Moments and a grunge heart embellishment from Tim Holtz. 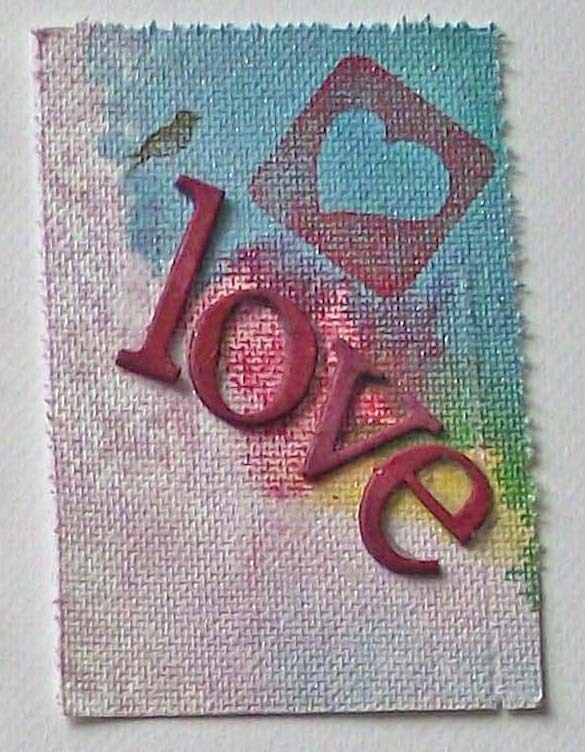 More watercolour pencils and a hand-written cursive 'love' is the base for this ATC. 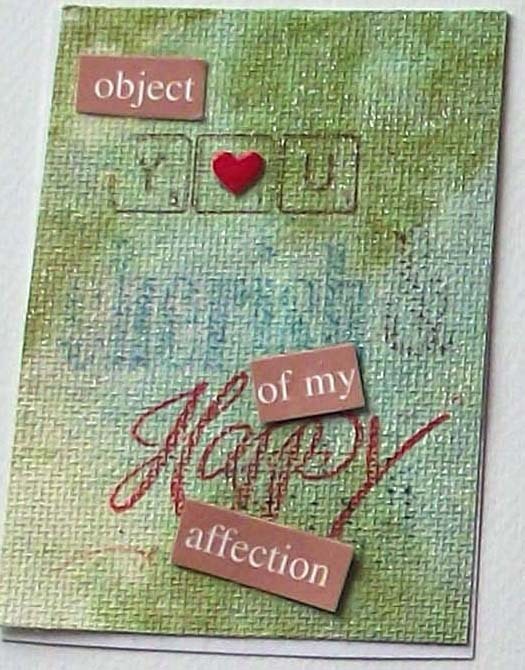 I added the grunge board heart that has a crackle -glazed finish and another scrpbooking caption to complete. 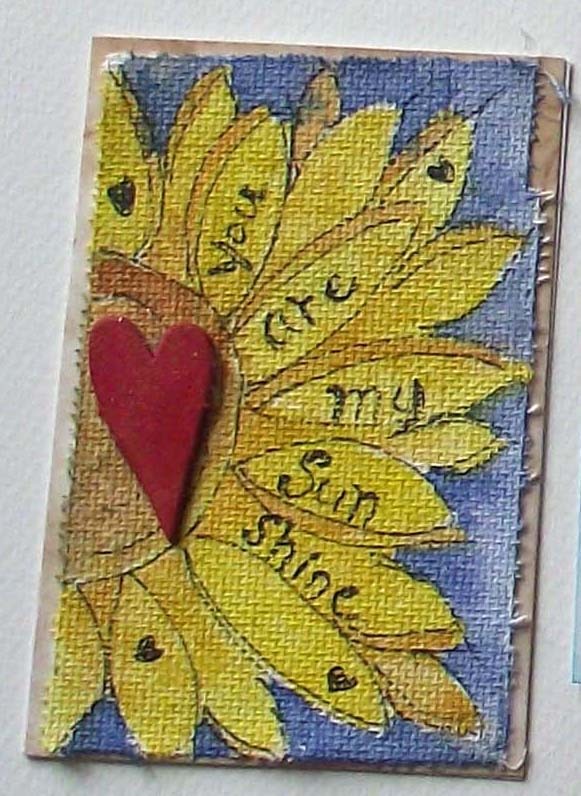 Hand-drawn sunflower with text coloured with watercolour pencils , background too, and brished with water to blend. 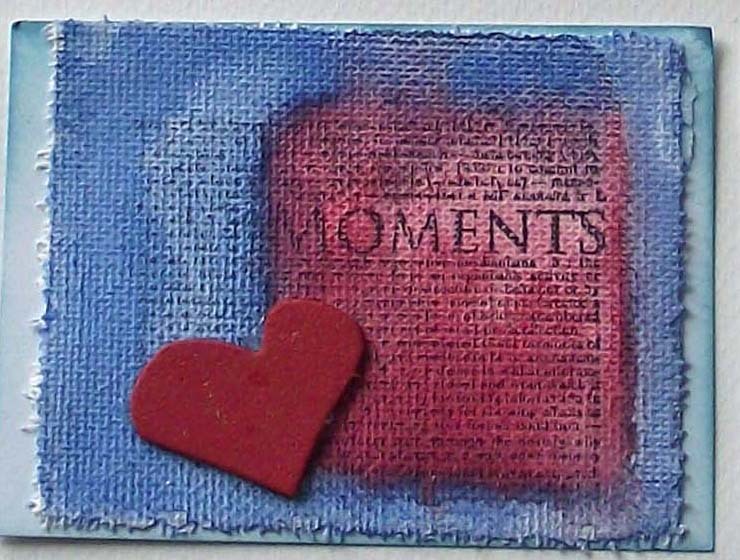 A grunge-board painted red was added to finish. 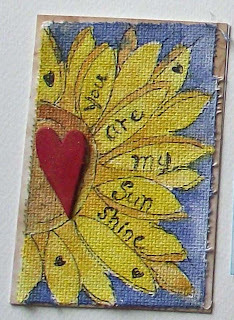 Another of the canvas backgrounds that was treated with inks, watercolour pencils, spray glitter and enamel. Grung-board 'love' lettering and a stamped bird and heart outline completes the ATC. I had a lot of fun doing these ATCs and I have become quite attached to them and I am sad to be letting them go. But...I know they are going to good homes. This messing about with canvas and ink and all manner of stuff has given me a few ideas of what I might like to try on a lager scale. Testing this and that and just going with the flow. LIke I said great creative fun. 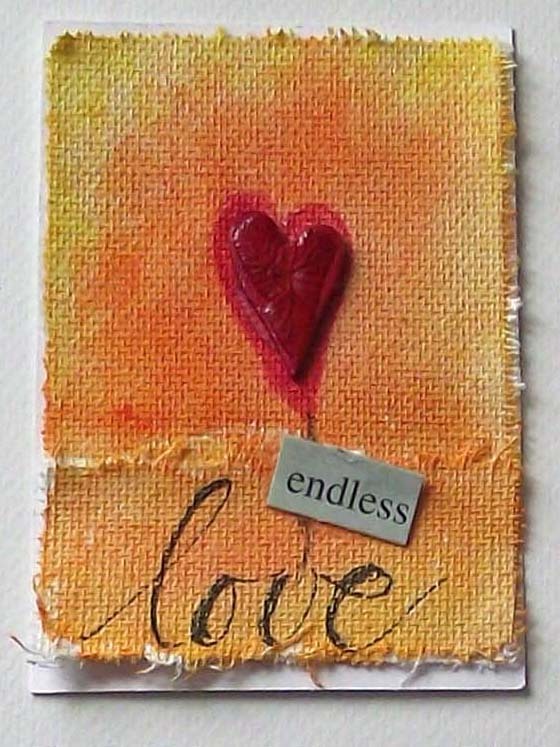 Thanks for stopping by to read my crafty blog. Your time is appreciated and your comments mean a lot.